The PackageFile Editor now supports explicit specification of argument passing conventions thru the ByRef and ByVal keywords. 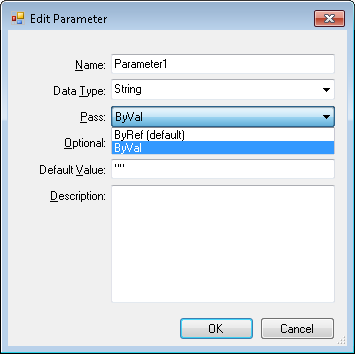 Choose either option from the drop-down combo box when adding a new method parameter to a PackageFile Routine. Default is ByRef.